SENATE President, Bukola Saraki, in a leaked audio clip has vowed that Kwara State will never take instructions from any political leader in Lagos State. Saraki, who spoke largely in Yoruba in the audio clip, stated this while addressing young Peoples Democratic Party, PDP, members in Kwara State. The leaked audio clip yesterday drew the ire of Socio-Economic Rights and Accountability Project, SERAP, which requested the Independent National Electoral Commission, INEC, to investigate the claim that the Senate President spent between N200 million and N400 million to influence the outcome of the 2015 elections for the All Progressives Congress, APC, in states of the federation. 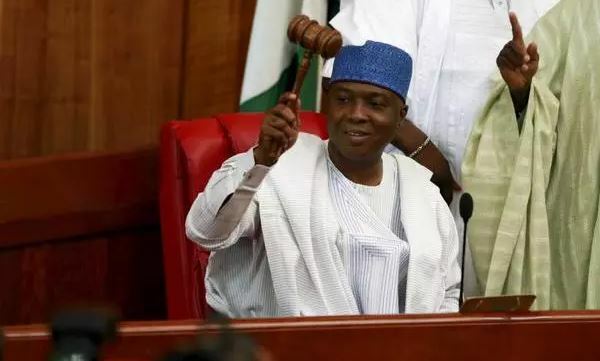 In the audio tape, recorded for about 33 minutes, which had since gone viral across social media platforms, Saraki, who defected from the ruling All Progressives Congress, APC, to the opposition PDP a few months ago, said he benefited little from his membership of the ruling party. In the tape, the Senate president threw jabs at APC national leader, Bola Tinubu, by pledging to protect Kwara from the grip of godfathers in Lagos. Although the former Kwara governor did not specifically mention the name of the Lagos-based APC leader, his words were punctured with anti-Tinubu rhetoric from his supporters. Saraki said if he remained the only member of the PDP, he would ensure that he resisted the �invasion� of Kwara by Lagos godfathers, alleging that he was being persecuted, despite helping President Buhari win election. �If you don�t even want Bukola, bring someone from Kwara and empower him. I know you young people are 'sharp'. Today, there is none in APC ('empowered' by government). Instead, they want you, they want us, to be going to Lagos to get instructions. Meanwhile, the Socio-Economic Rights and Accountability Project, SERAP, has requested the Independent National Electoral Commission, INEC, to investigate claims that the Senate President, Bukola Saraki, spent between N200 million and N400 million to influence the outcome of the 2015 elections for the All Progressives Congress, APC, in states of the federation. In an open letter to INEC chairman, Prof. Mahmod Yakubu, SERAP urged him to collaborate with other necessary agencies of government to investigate the veracity of the audio linked to Saraki, where he claimed to have spent between N200million and N400million in every state, except the six South-West states, to influence the outcome of the 2015 elections for APC. SERAP also urged INEC to "investigate the sources of other cases of apparently unexplained campaign financing and contributions for the 2015 elections by politicians and supporters of the two main political parties, the APC and the Peoples Democratic Party, PDP. Click on a word/phrase to read more about it.